This Persistence Market Research study offers an eight-year analysis and forecast of the global microcrystalline wax market for the duration 2018 – 2026. The study considers 2017 as the base year with market values estimated for the year 2018 and a forecast developed for the duration of 2018 to 2026. Compound Average Growth Rate (CAGR) of the microcrystalline wax market is represented from 2018 to 2026. The report covers comprehensive information about the trends, volume (Kilotons) and value (US$ Mn) projections, market dynamics, competition and recent developments in the global microcrystalline wax market for the study period 2018 to 2026. The global microcrystalline wax market is estimated to reach US$ 1,102.3 Mn by the end of the forecast period while registering a CAGR of 3.9% for the period 2018-2026. Major manufacturers are shifting their manufacturing facilities to more suitable locations and this is leading to demand for raw materials, such as petroleum-based feedstock. That apart, demographic changes are also generating pharmaceutical demand at a global level. These are some of the factors likely to majorly impact the microcrystalline wax market over the forecast period. In recent years, end markets for the petrochemical industry, including pharmaceuticals, cosmetics and plastics industries, have been booming at a global level. 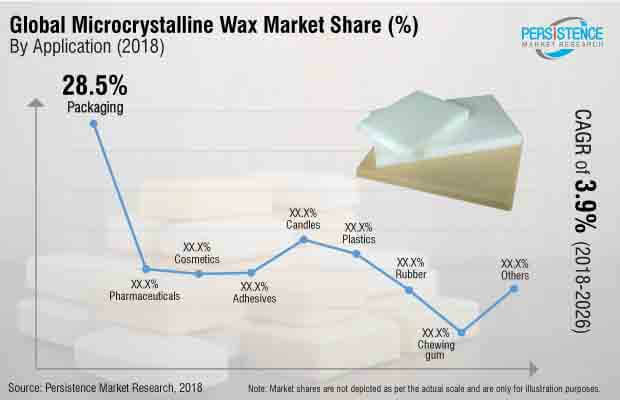 Robust domestic demand for chemicals and petroleum-based products has been a key factor responsible for the growth of the microcrystalline wax market. These industries are vesting in new policies to tackle challenges, such as increasing costs, lack of experience and technology gaps. As the global economy continues to recover, acquisitions and joint ventures are likely to become a more frequent industry phenomenon in the region. Industry leaders, such as pharmaceutical manufactures, cosmetics manufactures, etc., are looking forward to increasing their business portfolios and market share by entering into strategic partnerships. Increased strategic associations among end-users will create healthy demand for raw materials, such as petroleum waxes, microcrystalline waxes, etc. As a result, the global microcrystalline wax market is estimated to witness healthy growth over forecast period. All applications of microcrystalline waxes are collectively expected to grow at 3.9% CAGR, in terms of value, over the forecast period. In addition, pharmaceutical, packaging and cosmetic segments are collectively expected to account for more than 60% share in the total incremental $ opportunity created in the global microcrystalline wax market. Solvents are generally derived from refinery operations & petrochemical feedstock and are widely consumed by end-use industries. Microcrystalline waxes are produced by refining crude oils. Volatility in prices of these feedstock will result in fluctuating prices of microcrystalline waxes. This may act as a restraint for petroleum-based feedstock, thereby hampering the growth of the microcrystalline wax market at a globe level. This, in turn, will lead to less profit margins for microcrystalline wax vendors. Increasing industrial production, improved economic conditions and consistent growth in end-use sectors, such as chemical industry, oil & gas and paints & coatings, among other sectors, are expected to drive growth in demand for microcrystalline wax. The relatively established manufacturing sector in the country and increasing industrialization and urbanization will provide a firm platform for the growth of the microcrystalline wax market. South East Asia Pacific region is expected to register 1.3X growth in the market and will be followed by North America and Europe in terms of value. Regions including North America and SEA are expected to gain traction during the latter half of the forecast period owing to the anticipated growth of the manufacturing and pharmaceutical sectors in these regions. The other regions are expected to exhibit moderate growth during the same period. Apart from North America and Europe, all other regions are expected to lose market value share by the end of the forecast period. Collectively, SEA and North America are projected to register a CAGR of 4.0%, by value, and will witness significant growth in the microcrystalline wax market. The global microcrystalline wax market is highly fragmented, with no single market player holding substantial double digit market share as of 2017. Globally, the top 10 players in the market collectively hold between 30% and 35% of the market share. In the recent past, the microcrystalline wax market has witnessed significant developments from the competition perspective. New product launches, acquisitions and collaborations are some of the key preferred strategies opted by key players to expand and sustain in the global microcrystalline wax market. Some of the prominent players covered in this study of microcrystalline wax market are Sasol, MOL Group, The International Group, Inc., Calumet Specialty Products Partners, L.P., Indian Oil Corporation Ltd, Sonneborn LLC, Koster Keunen, Kerax Limited, Asian Oil Company, and CEPSA, Nippon Seiro Co., Ltd. and Holly Frontier Refining & Marketing LLC, among others. How has the microcrystalline wax market evolved in the last four years? What shape will the microcrystalline wax market take, in terms of volume and value, during the study period? What are the prevailing market dynamics in the microcrystalline wax market? What are some of the important developments and trends being witnessed in the microcrystalline wax market? What are some of the underlying macro-economic and industry factors impacting the growth of the microcrystalline wax market? Which are the key challenges, opportunities and improvement factors for microcrystalline wax market players? What are some of the market positioning and key strategies of key manufacturers as per the market taxonomy? How has the competition structured and evolved in the microcrystalline wax market over the past few years?